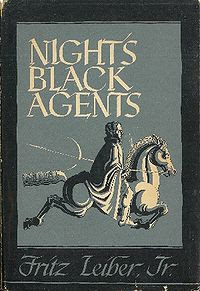 One of the more unusual tales of Fafhrd and the Gray Mouser is "Adept's Gambit," which, though written first, thereby making it the original appearance of Fritz Leiber's most famous characters, did not actually see print until 1947 in an Arkham House collection called Night's Black Agents. "Adept's Gambit" is noteworthy for several reasons beyond the date of its writing. First, it takes place in the real world, with the Twain wandering the streets of Tyre during Seleucid rule rather than Lankhmar. Second, the story was written under the strong influence of H.P. Lovecraft, which is why there are references throughout to "the Elder Gods." As I understand it, Leiber even sent a draft of the story to HPL, who recommended that he eliminate the Mythos references entirely. Leiber did not excise them all, but the published version of "Adept's Gambit" contains far fewer of them than the draft Lovecraft read -- a draft that has apparently been found and may, I hope, one day see print. It happened that while Fafhrd and the Gray Mouser were dallying in a wine shop near the Sidonian Harbor of Tyre, where all the wine shops were of doubtful repute, a long-limbed, yellow-haired Galatian girl lolling in Fafhrd's lap turned suddenly into a wallopingly large sow. It was a singular occurrence, even in Tyre. At first, Fafhrd believes that his companion is using magic to play a trick on him. "Scum of wit-weighted culture," he said, "I consider it the nadir of base perfidy that you should try out on me your puking sorcery." "Softly, man of strange loves," purred the Mouser. "This unfortunate mishap has befallen several others besides yourself, among them an ardent Assyrian warlord whose paramour was changed into a spider between the sheets, and an impetuous Ethiop who found himself hoisted several yards into the air and kissing a giraffe. Truly, to one who knows the literature, there is nothing new in the annals of magic and thaumaturgy." Despite Mouser's protestations, Fafhrd does not believe that his friend is not responsible for this "pig-trickery" upon him. He changes his mind, though, when a similar ailment befalls Mouser, whose kisses transform the objects of his affection into giant snails -- all that is except for a "cross-eyed Greek" girl named Chloe. This fact troubled both Mouser and Fafhrd, who, after some hoping for some other way to rid themselves of this bizarre curse "must fall back upon [their] last resource," namely the mysterious wizard Ningauble of the Seven Eyes. This amusing section continues for quite some time more, with Ningauble expressing unwillingness to help Fafhrd and the Gray Mouser, all the while insulting and belittling them as the red-headed barbarian grows ever more angry and closer to attacking the alien wizard. "Why is it, Riddle Vendor, that you always give us half knowledge?" Fafhrd pressed angrily. "Is that at the last moment our blades may strike with half force?" "It is because I know you too well, children. If I said one word more, Hulk, you could be cleaving with your great sword -- at the wrong person. And your cat-comrade would be brewing his child's magic -- the wrong child's magic. It is no simple creature you foolhardily seek but a mystery, no single identity but a mirage, a stony thing that has stolen the blood and substance of life, a nightmare crept out of a dream." What follows is far from a perfect story and certainly not, by any means, the best tale of Fafhrd and the Gray Mouser but it's nonetheless an enjoyable one, filled with exuberance and excitement. I enjoy it as much as I do, I think, because it represents Leiber's earliest portrayal of the Twain, in their raw and unrefined form. It's a great pleasure to see a master writer at the dawn of his craft, laying the foundations on which he will later build a great creative edifice. Reading "Adept's Gambit," I became ever more convinced that Leiber truly was one of the greats and that his greatness was there from the beginning. Oddly enough, for all Leiber's influence on D&D, I was never a great fan of Fafhrd and The Grey Mouser; they were well behind Conan, LotR, and the Elric saga for me. However, Leiber's modern fantasies, "Conjure Wife" and "Our Lady of Darkness" are among two of my very favorites. Leiber might be my favorite fantasy author. I have liked F & tGM since I discovered the books at the age of 13 or 14, and unlike a lot of other fantasy I liked then, I still appreciate these stories. I have all 7 of the recent reissues from Dark Horse including a book I have not read yet. Did anyone else read "puking sorcery" as "punking sorcery"? There seems to me to be a clear thread running from Dumas' Musketeers to F&tGM. Anyway, I love them both, and tend to read them back to back. It was a pure fan boy moment but I'll always treasure the talk that I attended with Fritz leiber at Norwescon. In a wheel chair and clearly suffering the ravages of age he had a mind so sharp he still had nearly all of shakespeare memorized. He truly was an interesting and singular writer. I've never read Leiber. I've read a lot of Howard and Lovecraft, but never any Leiber. I will have to correct that. Leiber did not excise them all, but the published version of "Adept's Gambit" contains far fewer of them than the draft Lovecraft read -- a draft that has apparently been found and may, I hope, one day see print. Very interesting. What is your source for that info? I to wish to know what dark pact you entered to learn of this manuscript. This might be blasphemy, but I think I prefer Leiber to Howard. Thats saying quite a bit, considering how much I like REH. I can't recall where I first read it. I think it might have been in S.T. Joshi's Lovecraft biography, but it could easily have been somewhere else. In any case, John Pelan is the scholar who found it and he was planning to publish it in a collection called Adepts & Arkham through Darkside Press but it's never seen the light of day so far as I know. The "Lovecraftian" version is apparently 10,000 words longer than the 1947 one, so it'd be interesting to read. Heh. As I said above, I don't remember the original source of my information, but, if you search online for references to John Pelan, Adept's Gambit, Adepts & Arkham, and Darkside Press, you'll probably find some more information about it. Ningauble is a great character, and an interesting inversion of the "tentacled horror from beyond" archetype- he's the only "friendly alien sorceror next door" I am aware of in all of classic pulp fiction. Thanks for the tip, James: time to fire off another email to Justin Leiber! The Cover That Inspired the Mind Flayer?